A Bricklayer's Guide to the Galaxy . . . 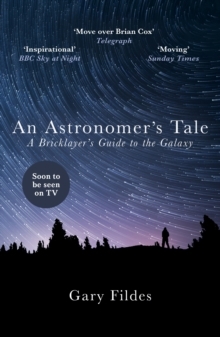 The inspirational memoir of a former brickie who followed his passion for the stars and built his own observatory. Perfect for readers of Robert Macfarlane, Helen Macdonald and James Rebanks - as well as fans of Brian Cox and the BBC's Sky at Night Gary Fildes left school at sixteen, got a trade like most of his mates and was soon married with four kids. His life seemed set. But he had a secret. Something he only practised late at night with a few like-minded friends. Then one day, middle age approaching alarmingly, he acted on his lifelong passion. He finally came out. As an astronomer. Today, Gary is the founder and lead astronomer of Kielder Observatory, one of the top ten stargazing sites in the world, which he also helped to build. Situated in the beautiful forests of Kielder, Northumberland, within Europe's largest protected dark sky park, it offers some of the UK's most spectacular views of stars, planets and galaxies. An Astronomer's Tale is Gary's inspirational story: part memoir, part nature writing, part seasonal guide to the night sky. It is a book brimming with passion; and at a time when the world is captivated by space, it will leave you ready to get out there and explore the wonders of the skies for yourself.